It’s hard to overstate the velocity and magnitude of the shift from mass to target marketing in an era when, as ComScore reports, 50% of mobile users have smartphones and 37% of digital page views occur on mobile screens instead of desktops. The intention to shift from mass print advertising to targeted digital marketing was articulated by Steven A. Burd, the chief executive of Safeway, in an earnings call with securities analysts on Feb. 21. 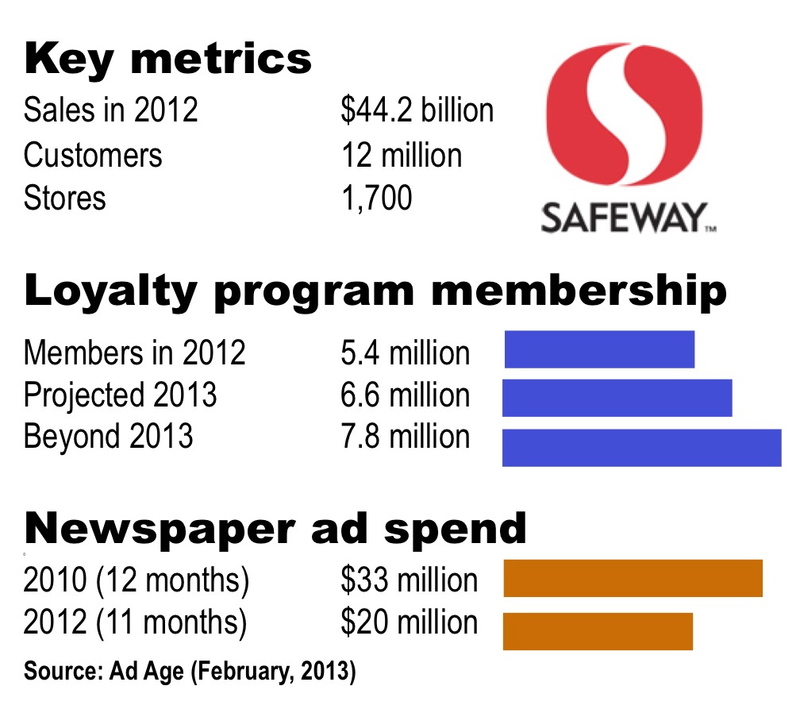 In reporting on the conversation, Advertising Age noted that Safeway, which is the 10th largest retailer in the country, cut its newspaper ad spend to $20 million in the first 11 months of 2012 from $33 million as recently as all of 2010. See selected metrics below. At the same time, Safeway has boosted the membership of its Just for You digital loyalty program to 45% of its base of 12 million customers, according to Ad Age. Burd’s goal, reports Ad Age, is to get some three-quarters of his customers into the program, which sends targeted offers to individuals based on their carefully monitored consumption patterns. Deborah L. Weinswig, Citigroup analyst: Steve, you say that Just for U has been better than expectations. Can you talk about the components of that and what you think the key drivers have been? Burd: Well, when I say better than expectations, we’re delivering about 50% more on – of added weekly sales per household – than we had anticipated. And what’s happening is, our best customers are becoming increasingly more loyal and buying more items per trip. And that’s been true now for – since the beginning of Just for U. Did that help you? Weinswig: Yes. Are you seeing that you’re getting kind of more loyal customers? Burd: Yes, our loyal customers are becoming more loyal, and customers that were less loyal are entering into that more loyal category. Robert L. Edwards, Safeway president: Yes. And Deborah, I'd also add that mobile users are higher than we had predicted. We’ll show you some slides at the Investor Conference in a couple of weeks, but we’re very pleased with the percentage of Just for U users. They’re using mobile technology because their incremental spend is higher and more frequent as well. Burd: In fact, it's higher by about 40%. And we have – I think since our last call, we’ve – maybe we launched the iPad application. Burd: So we basically are on all smartphones, plus an iPad application, which is quite different from the pure mobile application. And it’s attracting a lot of users. Still, I would say, the majority of users are still at the desktop stage. But we think that will change over time. Edwards: I think we’ve also been surprised at the amount of digital coupons that people are accessing on the website. Well, again, we’ll show you some data on that in a couple of weeks. So that's been a very positive feature of the program. Weinswig: And how has your relationship with your vendors changed as a result? Edwards: Very positive. Again, we’ve got some slides prepared to show you some incremental sales that our top CPG [consumer product goods] vendors are realizing relative to rest of market. And so the participation has been quite high. And so I think we’re pleased, but more importantly, our major CPG vendors are very pleased as well. Burd: You might recall that we started Just for U with about seven or eight of our key vendors and only recently have expanded that to the broader group. John Heinbockel, Guggenheim Securities analyst: Steve, if you think about Just for U, and the impact of payroll tax and more recently – I guess two reasons — the rise in gas prices, do you think Just for U has offset that impact, or the impact from those negatives have not been nearly as great as we might have feared? What do you think it is? Burd: Yes, I think that Just for U has clearly had an impact. When you look at our numbers, we can’t really see any decline that resulted from the payroll tax going up. Keep in mind that a Just for U user can save anywhere from 10% to 20% off normal Club Card pricing. And so that puts you right down there with the dollar stores and mass and everybody else. And so I think that Just for U has really helped. We cannot see any blip in our numbers as a result of the payroll tax kicking in. Edwards: I think actually that if disposable income is down because of higher payroll taxes or fuel cost, I think it actually plays to the strength of Just for U, because we can target specific individuals based on their shopping patterns and what we think is happening with their disposable income, because it doesn’t affect all of our customers equally. And so I think it actually plays to the strength of Just for U.
Burd: The other thing, John, is that Just for U applies to people of virtually all income levels. Talking to people at really some relatively high income levels, even the so-called top 1%, they’re using Just for U because they all have iPads, they all have iPhones. And it just seems crazy not to take advantage of pricing tailored to the individual household. Heinbockel: And one other thing related to Just for U: At some point there should be a benefit for you in terms of pulling back some promotional spend more broadly. When – I know we’re not there yet – when do you think we get to the point where it does have a positive impact on gross? Burd: I think that we could get there probably late in 2013. Also, as people become more digital, there’s an opportunity – which we’re working hard at – to actually get out of the paper ads, and make the ad itself personalized for every household. As a customer of Safeway's Dominick's subsidiary, which was the first to get Just For U, it definitely doesn't bring prices down to dollar store levels. First of all, Dominick's is overpriced on most items. Second, Just For U starts out great & then they keep reducing the discounts. Third, the system just is flat out goofy at times. As in that I occasionally buy clearance meat at 50% off the regular price & then it offers me the same relatively expensive steak at a 5% discount of the regular price. The page layout online is atrocious & I don't want or can't use 95% of the items. Occasionally the site is simply down or won't work correctly. It's not going to replace paper ads, just the same way a paper map is still better than a GPS unit because with the paper map, you see the entire area, rather that a small slice of the area! I don't know much about Dominick's or Just for U, but I'm pretty sure your analogy to a GPS is spot-on. A mapping application on pretty much any smartphone or tablet can give you both a varying bird's eye view of or turn-by-turn direction to almost anywhere in the world. Which of course renders the paper map to something along the lines of "quaint" and almost comical. So perhaps Just For U is like a GPS -- useful for what it does, but not always useful in all cases -- or it may be a preview of a mapping application; either way print is quaint. Agreed that advertisers are better served by going directly to the customer whenever possible, and that print newspaper advertising has not bottomed out by any means. But I doubt Just for U is the success it's portrayed to be in this interview. They're offering no hard numbers on actual usage of the service, which is a big red flag. If were the head of any major business that was spending big on newspaper insert advertising, I would be using every resource I have to get out of it. 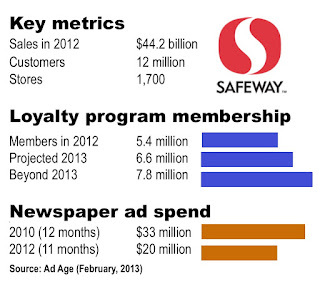 Newspaper inserts are waste pure and simple and digital is much much better, whether Safeway's program works or not. And I'll take GPS over a printed map any day of the week. As the person who actually does grocery shopping based on what's on sale in any given week, the ONLY thing I read out of ANY print daily is my grocery's flyer. It comes in a direct-mail shopper full of other inserts. I don't buy anything to get it, I just have a pile to recycle. I think there is still life in the old dog until that killer app appears, with all of its knowledge of my purchasing preferences. It just hasn't yet. But it will, and I will use it when it does. Small and big business- Take back control of your coupon deals! Why pay some companies $20 to $53 per customer when CouponPhone, that uses a brand new model of Digital Couponing that is non-intrusive and permission based will give a better result for $0.25 or less. smart shopping. We’ve been shopping at VONS, as Safeway subsidiary, for decades. VONS has a program that may be similar to “Just for U” with its VONS Club. They changed the club program last year to make you sign on to their web site to get coupons and the best price with your VONS Club card. VONS prices are already high so you need the club card just to get close to the everyday low pricing of a regional supermarket chain. They even provided PCs in the store to make the transition easier. But the PCs were not protected with anti-virus or on a secure server. I complained to store personnel but nothing was done. We’ve reduced our shopping at VONS substantially because of the new club program and increased our shopping at the regional chain because of their everyday low price strategy. No card is needed. We’d switch all of our shopping to the regional chain except the VONS store is more conveniently located. My wife and I both carry iPhones so digital is not the issue. Convenience and low price are more important than chasing nickels on my smart phone (and paying for data to the phone company). Neither chain advertises in my newspapers so it’s no skin off my nose what they do. In my opinion, Safeway might have a better chance of making the digital work if they stuck to the club card and email. Meanwhile, I see the print ad and I don’t see their digital ads.